PNCR General Secretary, Amna Ally flanked by other officials. Nominations were Tuesday being submitted for top party and central executive positions of the People’s National Congress Reform (PNCR). 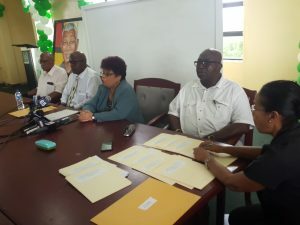 Party General Secretary, Amna Ally told reporters that so far Joseph Harmon, Volda Lawrence and Basil Williams were nominated for the post of Chairman, based on submissions Regions 1, 2, 9 and the North American Region. She said so far, no one has submitted nominations for the post of leader to challenge incumbent David Granger. The seven nominees for Vice Chairmanship are Volda Lawrence, George Norton, Joseph Harmon, Cosbert Roberts, Annette Ferguson, Winston Felix and James Bond. Roberts is based in the United States. Demerara Waves was later told that Chris Jones was also nominated for the post of Vice Chair. Ally said after nominations close at 2 PM Tuesday, the Returning Officer Michael Somersaul and Assistant General Secretary, John Yates would be checking the eligibility of the nominees. Delegates to the Biennial Delegates Congress will elect the top officials and Central Executive.